Your luscious locks deserve to be pampered and this invigorating Hair Oil is just the thing to give your locks some love! 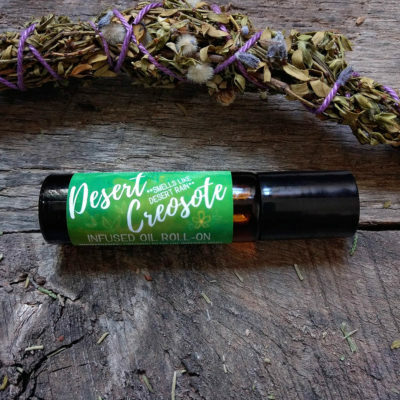 This all natural oil blend is slowly infused with leaves of organic rosemary (grown at our ranch) and then topped with additional energizing essential oils of Rosemary and Peppermint. 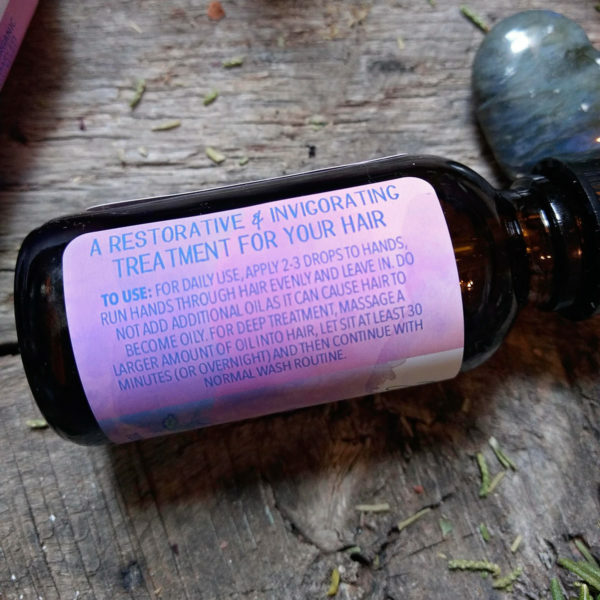 The result is a hair and scalp oil that nourishes and repairs hair and refreshes your scalp! 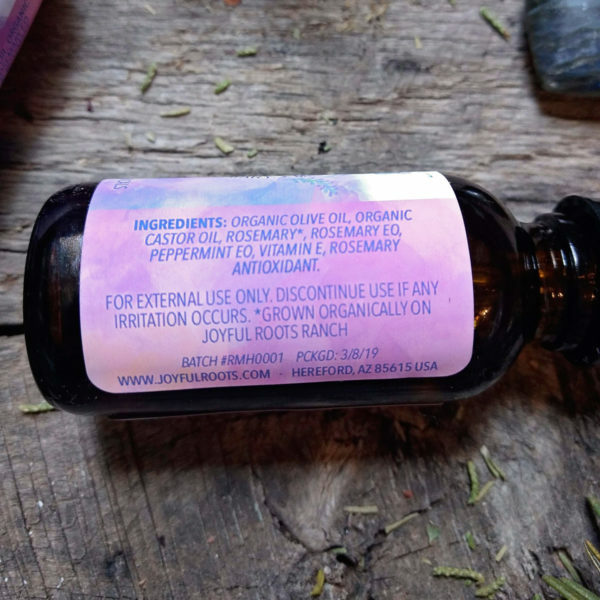 Ingredients: Organic Olive Oil, Organic Castor Oil, Organic Rosemary from Joyful Roots Ranch, Rosemary Essential Oil, peppermint Essential Oil, Vitamin E, Rosemary Antioxidant. Repair dry and damaged hair, or use this as a styling aid for smoother hair. The rich olive oil adds softness and strength to hair by penetrating the hair shaft and preserving moisture. It smooths the outer cuticle of the hair. Thick and luxurious castor oil contains ricinoleic acid which locks in moisture ad stimulates follicles for extra hair growth. 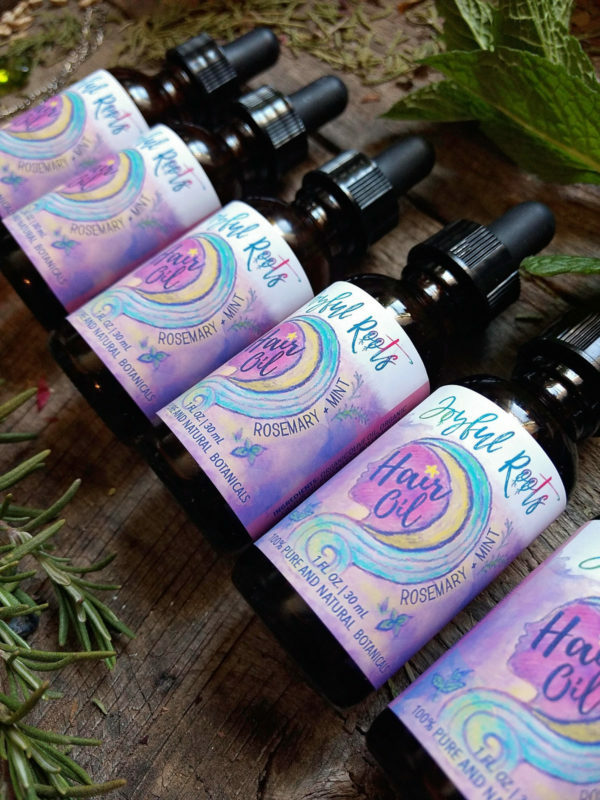 Rosemary not only smells amazing but it can counter hair loss by stimulating blood circulation in the scalp and it also protects hair from damaging free radicals. 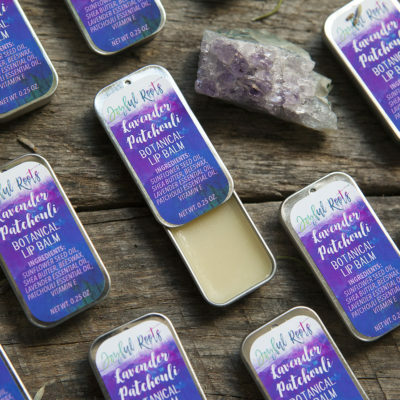 It is anti-inflammatory and can alleviate flakiness and itch. Peppermint feels amazing and invigorating! Plus is smells oh so good. 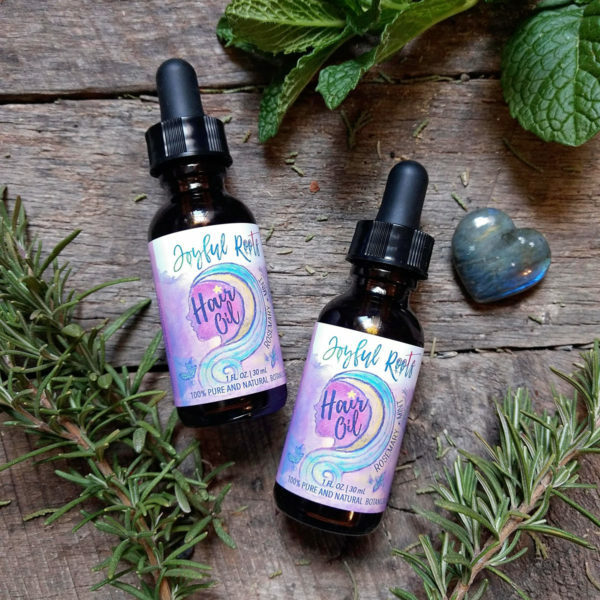 In a similar manner to Rosemary, Peppermint stimulates blood flow to the scalp which has a host of benefits to your hair. 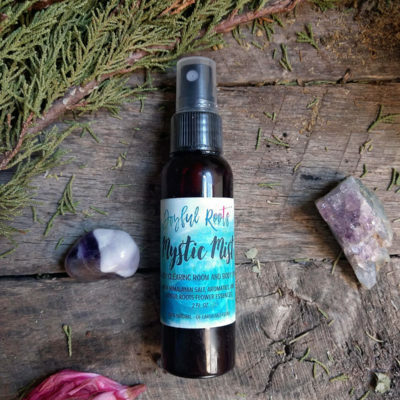 TO USE: For Daily use, Apply 2-3 drops to hands, run hands through hair evenly and leave in. Do not add additional oil as it can cause hair to become oily. For deep treatment, massage a larger amount of oil into hair, let sit at least 30 minutes (or overnight) and then continue with normal wash routine. You can also apply some heat prior to washing for deeper penetration of oils into the hair.